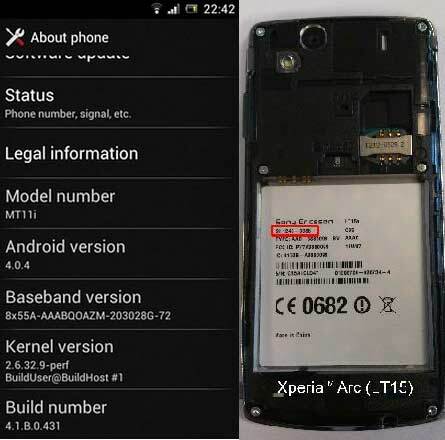 If you bought any of Sony Xperia Arc or Neo (previously known as Sony Ericsson Xperia Arc & Neo) handset then it’s the time for you to change your handset with ICS experience. Both handsets receives latest version of Android OS, 4.0.4, but they're sticking with an older kernel - 2.6.32. The update is being rolled out in stages, so it might not be available for your unit just yet. Before updating you must check your SI number printed under the battery. The SI is identified by an 8-digit number in the format XXXX-XXXX. Its written just under Sony Ericsson logo under the battery on both handsets. Xperia phones that already got the ICS 4.3.3 update (arc S, neo V and ray) will also be getting the Android 4.0.4 update soon. The remaining Xperia phones from the 2011 lineup - Xperia mini, Xperia mini pro, Xperia pro, Xperia active and Live with Walkman - are also to get the 4.0.4 update starting some time this week.